A home’s true colors by determining what kind of condition each inspected system and component is in. Potentially defective components and how they may impair the home’s integrity or maintainability. What kind of solutions are out there and why they should be explored before a buying decision is made. Infrared Thermography, commonly known as Thermal Imaging, is a specialized technology that has proven amazingly useful in the home inspection industry. We include a Thermal Imaging scan for free with every complete home inspection—a value that shouldn’t be passed up! An infrared readout of home components can clue us in to electrical issues, moisture intrusion, and areas of energy loss that couldn’t be identified by other means. After an inspection is finished, we dive right in to the next phase of the process, generating a comprehensive report of our findings in 24 hours or less. Often, your report will be available the same day! Our meticulous inspection reports summarize the details about a home’s condition without compromising easy readability. We include photographs of the home wherever they may prove to be helpful in conveying relevant information. Access to the groundbreaking Create Request List™ (CRL™) feature by HomeGauge is included with every inspection report. Home inspections start at just $300 for condos and $325 for standard residential homes. We proudly serve the North Georgia area with inspection services, including Jasper, Ellijay, Blue Ridge, Alpharetta and Johns Creek. We offer a 10% discount for all veterans on inspection services. Contact us for more information. 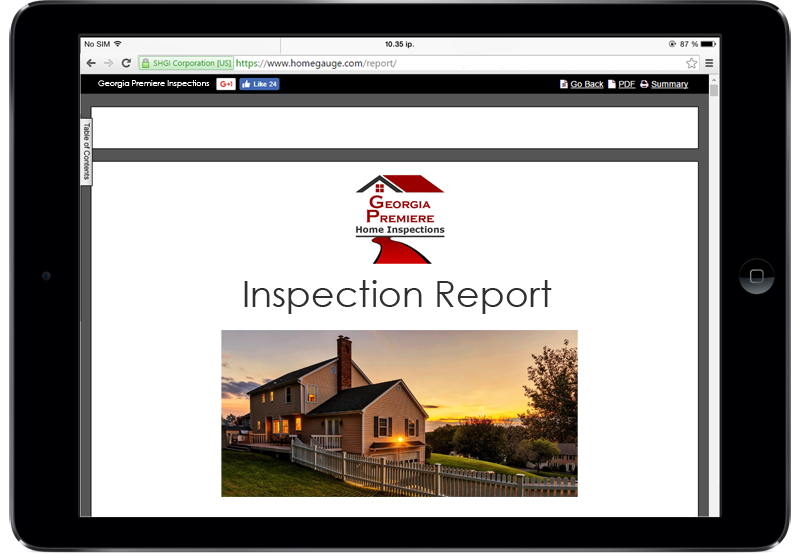 At GA Premiere Home Inspections, we’ve worked in, on, and around homes for over 30 years. That experience has made it possible for our home inspections to diagnose mistakes that were made in a home’s construction as well as defects that have emerged over time. Contact us today to request an inspection.